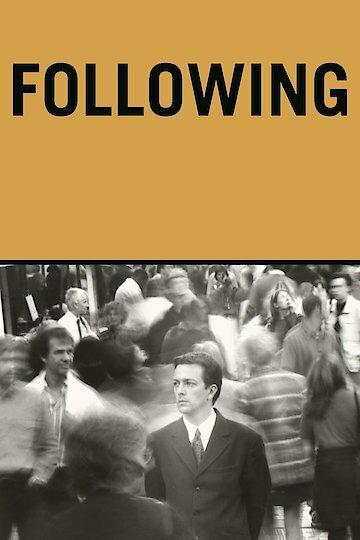 Following is about a struggling writer known as "The Young Man" who walks around the streets of London following random strangers around in hopes to find inspiration for his first novel. The Young Man sets specific rules on who to follow and how long he should follow them. On his first day, he notices a man dressed in a suit. After following the man for quite some time, he is eventually spotted. The man is introduced as Cobb. Cobb then explains to the Young Man that he is a burglar. Cobb explains to the Young Man about how he goes about his business as a burglar. He also mentions about how he learns about his targets by going through their personal belongings. After Cobb divulges his criminal activity, the Young Man decides to commit a burglary himself. Cobb guides him every step of the way. Cobb suggests to the Young Man to change his appearance. The Young Man cuts his hair and wears a new suit while assuming the name of Daniel Lloyd, one of Cobb's previous targets. The Young Man later meets a blonde woman whose home he and Cobb have broken into. The Blonde is revealed to be the girlfriend of a gangster named the "Bald Guy." The Blonde ends her relationship with the Bald Guy after witnessing the latter commit a murder at her home. The Blonde reveals information to the Young Man about the Bald Guy possibly blackmailing her with incriminating photos. The Young Man proceeds to break into the Bald Guy's safe. While searching through the safe, the Young Man is confronted by a man. The Young Man kills him and flees with the safe's contents, including photos of The Blonde. The Young Man turns himself into police after the burglary. Following is currently available to watch and stream, buy on demand at Amazon, Google Play, iTunes, YouTube VOD online.